All the screws you will need are included with the SSD and mounting holes are supplied for both bottom or side screw mounting in to the SSD chassis, mount it, plug it in, off you go. As with most SSDs the Kingston HyperX 3K is preformatted and even comes with data transfer and drive clone software to assist you in replacing your main drive. Done have a spare 2.5 bar or a compatible HDD tray? No problem, Just with the regular installation all extras you need including the bay adapter are included, simply screw the SSD to the tray and screw the tray Into any available optical bay..
Again all necessary extras are included, simply slip the drive in to the enclosure, reattach the lid and slide the lock closed, then it is just a matter of plugging in using the included USB to miniUSB cable and away you go. Kingston could not have made the process any easier without including a little man in the box to install the drive for you. Do not let the low Write times fool you, tests were performed using the HyperX 3K as the main drive, IE a system in full use running several tasks at the same time, it is all well and good for a company to list speeds for a device but what you will get 9/10 is the flat out empty drive speed, whilst they make for nice numbers, they do not accurately reflect a devices potential. Finally it is catching on with industry professionals to test some devices in a fully utilized state to more reflect real world conditions. 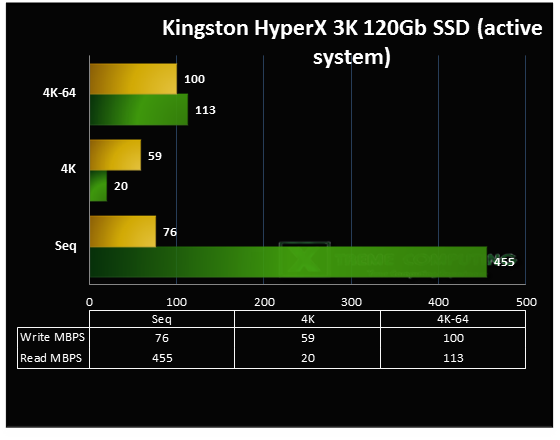 Taking these scores in to account as being in an “active” system, Kingston have done a fine job with the HypeX 3K, maintaining high speeds whilst running a full system and even whilst running file transfers, games, multi tab browsing and various other tasks. 20plus tests conducted over several hours gave consistent good results.